WataugaWatch: Brisson Makes It Official: "I'm a Freakin' Republican!" Brisson Makes It Official: "I'm a Freakin' Republican!" 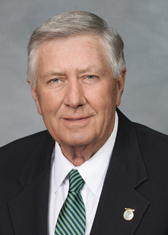 William Brisson, nominal NC House Democrat from Bladen County who has made a career of voting for the most noxious Republican bills, has formally switched parties. Brisson famously supported HB2, which did so much positive good for our state. Brisson voted for the monstrous voter photo ID bill, which did so much positive good for ballot access and has been thrown out as unconstitutional. Brisson has felt very cosy with the American Legislative Exchange Council (ALEC), the corporate author of so much of the legislation that Brisson liked to vote for in Raleigh. Brisson achieved fame as one of "The Five Goobers" in the NC House for voting for Republican budgets and then voting to override Governor Beverly Perdue's veto.